Bruce Pollock on If you like The Beatles, you might like… what? In future, if they’re not already, fan communities will quickly become the most authoritative archivists for the artists they follow. They collect memorabilia and ephemera — from ticket stubs to magazine interviews and amateur bootleg recordings — that most people would dismiss as tat… As well as memorabilia, these items will include what are currently rare and hard-to-find audio and video recordings, which will be collected by both human foraging and automated 'sweeping' of the Net. Expert fans will catalogue them and record their digital fingerprints, to help identify whether further discoveries are duplicates or new additions to the archive. Many of my projections in this area were based on observing the way Andy Aldridge has developed the Head Full of Wishes fansite for Galaxie 500 and associated 'downstream' acts. I profiled Andy in the book and also in this interview. There are a few rules of thumb I use to filter what I write on this site. 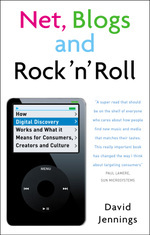 The first is that it must have some bearing on the themes of digital discovery in Net, Blogs and Rock'n'Roll, the book. The second is that I don't really do 'news' items here, unless I come across something that I believe deserves higher profile than it's likely to get from other channels. If you want news, you're better off going to a site that specialises: I use mediaor (built by Jason Herskowitz), which aggregates material from about a hundred music news and discovery sites (including this one!). Thirdly, I always try and add something new to the 'raw data' in terms of analysis or insight — or, when I'm lacking insight, attitude. Celestial Jukebox: free streams or pipe dreams? — Music Tank event yesterday, with keynote from Last.fm and responses from labels, rights organisations and technologists. If you're feeling nosey, there's also a mix of other personal stuff on the same blog (and if you become a friend of mine on Vox, there's even more embarrassing stuff).